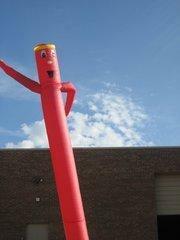 Bring attention to your event with this nearly 20' high red sky guy with yellow hair and hands! $50/day or $300/week. Pricing does not include delivery. Please call for delivery pricing.